Both GPS and NTP master clocks will keep time very accurately, but there are a few key differences that you should consider when choosing between them. GPS accuracy is ~ 1 microsecond. NTP accuracy is ~ 100 milliseconds. GPS is more accurate than NTP and has less latency compared to NTP. clear sky, and after satellites are locked, the GPS master clock will send a signal every second to the slave clocks. After the GPS master clock is installed the user can adjust the day light savings, and tie zone via push buttons or Infra red remote. NTP: The NTP clock will be connected to a local ethernet/internet using cat 5 or cat 6 no different than a printer. Once connected it will acquire its IP address from the DHCP server. The NTP clock has a mini-web-server built in, that allow the user to log in using any computer on the local network and set the time zone, day light savings, and the NTP server IP address to get the time from. A list of these public servers is available online. If you have a multi zone clock, you will be able to change the zones and or location using your browser. Once installed the GPS system will be completely maintenance free, satellite time is widely available and the systems will keep the time very accurately without any human involvement. The only thing that can block GPS signal is the weather. On the other hand NTP servers could go down. Either because of network failure, due to a decision by the agency/company that operates the NTP server or cyber attacks. GPS systems are also more secure as no one can access them, and they are not connected to your network. GPS master clock is more expensive than NTP master clock due to cost of material, mainly antenna, and GPS receiver. You can also have a master clock that is not synchronized to an external time service, and our clocks are very accurate with +- 12 seconds per year, which means that you might need to adjust them once a year. 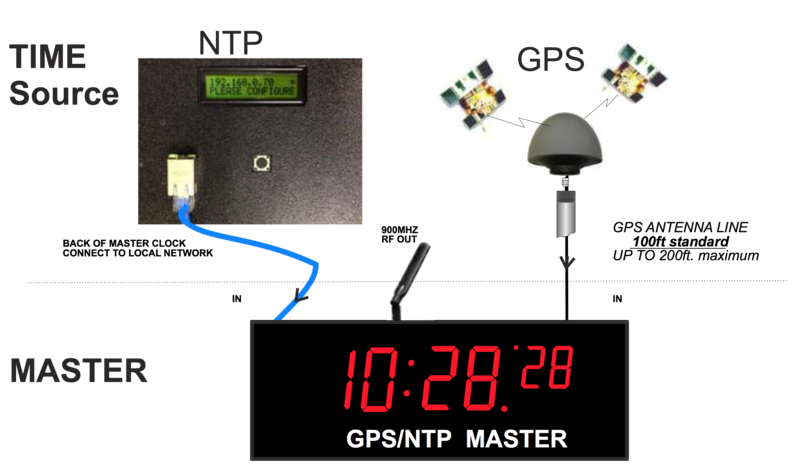 Need help to decide between GPS and NTP master clock system?